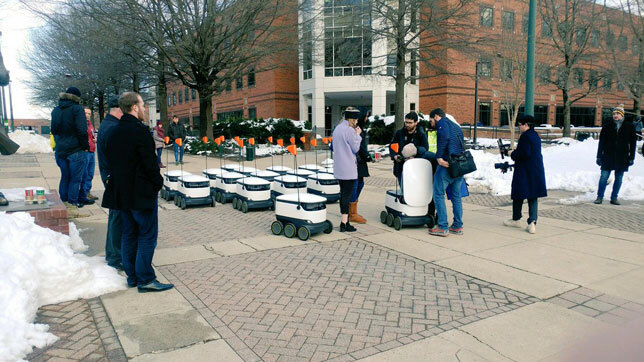 George Mason University has what is easily one of the first large-scale college programs to use robots to deliver food on campus. 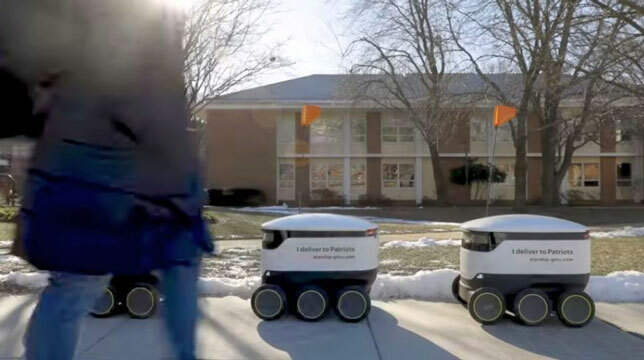 The service was the brainchild of two companies, food service operator Sodexo and delivery robot company Starship Technologies. Now, members of the Mason community can pull up an app on their iPhones and Android phones to order food and drinks for delivery anywhere on the campus. Delivery costs $1.99 and runs from 8:00 in the morning to 9:00 at night. Right now, food options are limited to some items on the menus of three participants: Blaze Pizza, Starbucks, Second Stop and Dunkin' Donuts. More on-campus restaurants are expected to join the list in coming weeks. Currently, the fleet has 25 robots. The service works in conjunction with student meal plans, and the two companies behind it said they're hoping to simplify the "busy lives" of Mason students and faculty. To put in an order, users open the app, choose what they want and drop a pin for the delivery destination. Through an interactive map on the app, they can then watch as the robot makes its journey to their building. Since the robot won't go inside the buildings, when it has arrived, the customer receives an alert to go meet the robot and unlock the order. The process takes about 30 minutes or less, depending on what's ordered and how far it needs to go. Each robot can carry up to 20 pounds worth of goods, which equates to about 10 large pizzas or six dozen donuts. "We're excited that our students, faculty and staff get to be at the forefront of this pioneering campus food delivery service," said Mark Kraner, the university's executive director for campus retail operations, in a statement. "This will enhance life for everyone at the university, and that's something we're continuously looking to build upon." "Being able to get food delivered to me within minutes is going to be fun and convenient," added Mason student Jenna Dayton. "The lines can get long in between classes, and once you get a table at the library, you don't want to give it up. Not only will this make my life easier as a student, but I'm going to get a visit from a robot!"